Abstract: In this book I argue that the varied visual and textual source material related to Matilda (1156-1189) provides an insight into her duties and responsibilities at her husband’s court. In order to address this question I have taken the visual evidence as my starting point. These sources are studied in combination with a variety of written sources. Together they are examined within the context of medieval ideas about women and their participation in this society. This will provide a better understanding of Matilda’s actions. Additionally, the renewed study of the art works will also nuance some former interpretations concerning their dating and meaning. Within this study there are four important themes: 1. women in textual and visual sources; 2. authority and power; 3. women as makers of art; and 4. performativity. In order to examine Matilda’s responsibilities and duties at the court and to get an insight into those of noblewomen in general the first chapter is concerned with the Rolandslied. This chanson de geste was commissioned by Matilda and Henry around 1173 and while it is not the only text associated with Matilda, it is the only one that can be connected to her convincingly. A close reading of its epilogue convinced me that the text has been too easily attributed to Henry’s patronage. That Henry has been considered the text’s patron is due to the fact that medieval chronicles and charters often credit men as the patrons of art and architecture, when in fact women were the driving forces. The Rolandslied not only testifies to female patronage, which I have labelled matronage, but will prove an important source as well when we want to explore the responsibilities medieval noblewomen held. Of course, this epic story about Charlemagne and his fighting heroes is a story for and about men defending the emperor and Christianity. Yet if we set aside the brutal fights and the way the Christians and Saracens try to mislead each other, it becomes evident that women play a role in the story as well. Thus far this has not been acknowledged by literary historians studying the German Rolandslied. In Chapter 2 I contend that the bracteate depicting Henry and Matilda is not merely a confirmation of Henry the Lion’s authority, but that it communicated the notion of Matilda as a consort as well. This idea is supported by the coin’s iconography. This is the only coin type on which Matilda is depicted. That she holds a lily-crowned sceptre testifies to authority and rule. Moreover, there are circumstances that I believe requested this coin type to be issued. 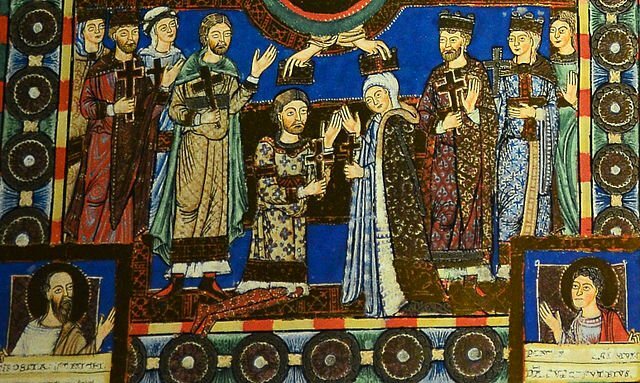 Henry’s long-term absence in the years 1172-1173, when he went to the Holy Land, offered Matilda the opportunity to wield authority as his consort. I suggest that the idea of consors regni, or co-rule, was put into practice. This is supported by a rereading of a passage from Arnold of Lübeck’s Chronicle (ca. 1210). Arnold was closely related to the Welf court. The last chapter takes as its point of departure the idea that the dedication and coronation miniatures in the Gospel Book of Henry and Mathilda together with its dedicatory text can be considered in relation to performativity. I have chosen this concept since it refers to acts and the presence of an audience at a specific time and place. Moreover, performativity suggests a conscious construction of identity. The construction of Matilda and Henry’s identities in word and image in the Gospel Book can be seen as the result of performativity. Since Matilda was intentionally added to the Gospel Book in text and image, her contribution was considered important. Therefore be considered as a ‘maker’. On a general level her presence in the Gospel Book is instructive, because it underscores the notion that Matilda – like the women in the Rolandslied – was expected to perform several roles. She was considered daughter of the English king, Duke Henry’s consort and as such the mother of Henry’s children. Additionally she was a benefactor of the town of Brunswick and its churches. Moreover, the way she is portrayed also contributes to her husband’s position: his fame is enhanced by marrying a princess. Lastly, I have studied Matilda’s presence in relation to St Aegidius (or Giles), the expression consorte thori and the visual absence of (named) children. This has led me to suggest that the Gospel Book might be considered a votive offering in order to render thanks to the birth of a child, or to secure the birth of a male heir.